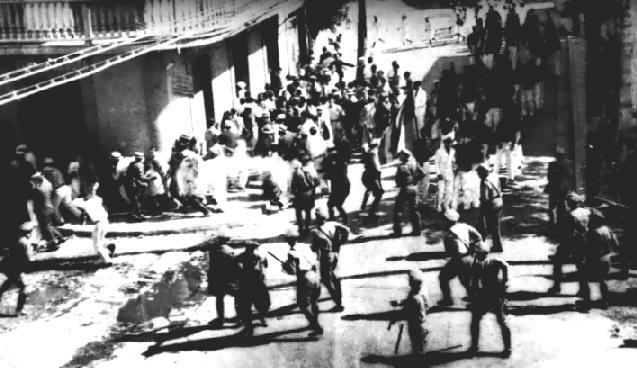 In March 1937, several days before Palm Sunday, Puerto Rican Nationalists in the city of Ponce obtained permits for a parade and demonstration. The former was to commemorate the end of slavery in 1873 while the latter was to protest the detention of one of their leaders, Dr. Pedro Albizu Campos. Ponce’s mayor, José Tormos Diego, granted the permits. Campos had been involved, along with other Nationalists leaders, in violent clashes with authorities during the previous few years. He had been convicted of sedition and was being held pending appeal. Winship objected to the planned Ponce demonstration and ordered the Insular Police, a state police created and controlled directly by the US-appointed governor, to work with the mayor to stop it. Without notice to the organizers, the permits were withdrawn. As Puerto Rico’s national song “La Borinqueña” began playing, the demonstrators started marching. The police fired at them from four different positions for over 15 minutes killing 17 men, 1 woman, a 7-year-old girl, wounding over 235 and arresting over 150 armed protesters. 2. Civil Liberties have been repeatedly denied during the last nine months by order of Governor Blanton Winship. He has failed to recognize the right of free speech and assemblage. Force has been threatened toward those who would exercise these rights. 3. 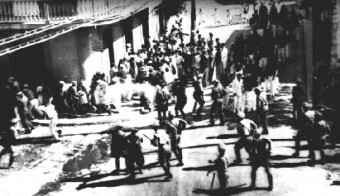 The Ponce Massacre was due to the denial by the police of the civil rights of citizens to parade and assemble. This denial was ordered by the Governor of Puerto Rico. . . . Governor Winship remained defiant. During a military parade in Ponce in July 1938, Nationalists attempted to assassinate him, although their shots went wide. In 1937, Marcantonio launched a concerted campaign to remove Winship . . . . During an appointment with Roosevelt, he charged that Winship’s administration was characterized by “graft, crime, and corruption” and presented evidence . . . . On May 12, 1939, Roosevelt removed Winship as Governor. Despite being removed from office, neither Governor Winship nor any of his cronies were charged or convicted in the murders of 19 people. The Story of Dr. William Brydon, One of the Only Survivors of the Massacre of Elphinstone’s Army That Included Over 16,000 People Killed. Jesus T. Piñero, the first Puerto Rican to serve as its governor, was appointed by President Truman in 1946. The next year (1947), the U.S. congress passed the Elective Governors Act, allowing Puerto Ricans to elect their own governors. In 1950, Congress authorized Puerto Ricans to draft their own constitution and that constitution, which transformed the territory into the Commonwealth of Puerto Rico, was approved in 1952.